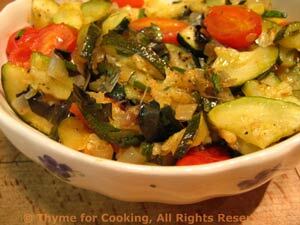 Zucchini, Cherry Tomatoes, Lemon, Thyme for Cooking Mediterranean. This is a lighter version of the traditional Mediterranean dish. Finishing with a bit of lemon gives it a fresh flavor. Cut ends off zucchini, cut in half the long way and then into 1/4 inch slices. Sauté in medium nonstick skillet over medium heat until soft and translucent, about 15 minutes. Add tomatoes, herbs to zucchini and stir to combine. Sprinkle with lemon juice, stir gently and serve.